We prepare different types of kootu dishes for our lunch and most of the kootu varieties can be easily identified with its taste and texture. But this raw papaya kootu is completely different. You won't believe this dish is made with raw papayas. There is no smell of papayas and the taste was so amazing with sambars, rasam and even for chapathis. The addition of cooked moong dal and the coconut paste makes this kootu more tasty. As I said earlier in my posts, please do not cook the vegetables in pressure cooker for kootu because it can destroy the beautiful colour and the nutritive value of the vegetables. For any kootu do the tempering in the final stage. Check out my other kootu recipes here. Raw papaya kootu - Raw papaya with moong dal and coconuts. Very good side dish for sambar, rasam and chapathi. Pressure cook the moong dal and keep it aside. Peel the raw papaya's skin and remove the seeds. Cut them uniformly into small cubes. Take a deep vessel and add the raw papaya cubes. Add 1/2 cup of water and cook until soft. 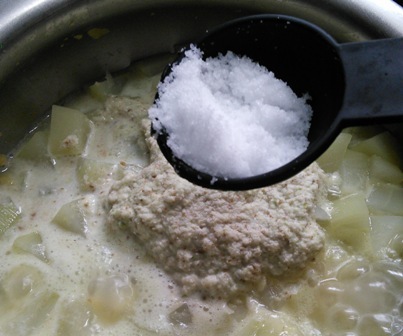 In the meantime, grind the coconut, green chilly, small onions and cumins nicely. 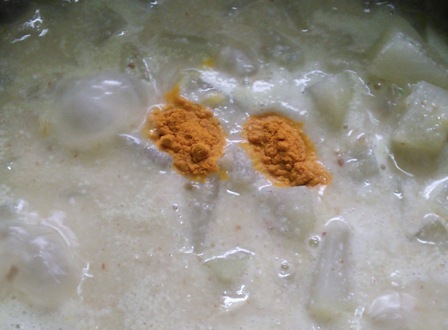 Next, add the coconut paste, cooked moong dal, turmeric powder and required salt. Mix them gently and cook till the raw smell disappears. Heat oil in a pan and add the mustard and urid dal. When it splutters add the curry leaves and pour it to the kootu. Close the kootu with a lid. Serve this kootu for sambar, pulikuzhambu, rasam and also for chapathi. 1. Peel the raw papaya's skin and remove the seeds. Cut them uniformly into small cubes. 2. Take a deep vessel and add the raw papaya cubes. 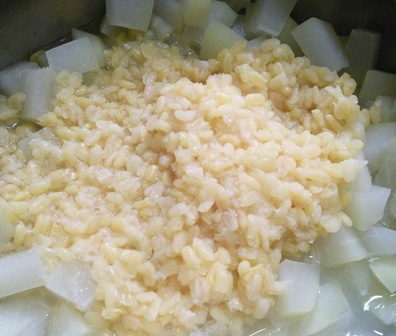 Add 1/2 cup of water and cook until soft. (Close it with a lid, leaving a small gap. Check frequently to avoid burns and add some water if necessary because some papayas take more time and water to cook). 3. 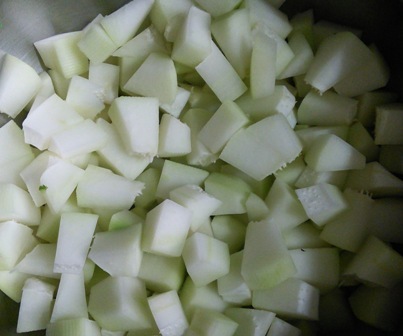 In the meantime, grind the coconut, green chilly, small onions and cumins nicely. When the papayas turn soft, add the coconut paste, cooked moong dal, turmeric powder and required salt. 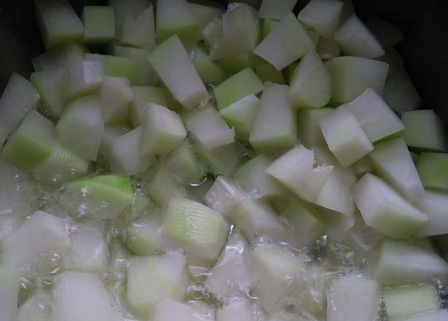 Mix them gently and cook till the raw smell of the cumins and small onions disappear. 4. 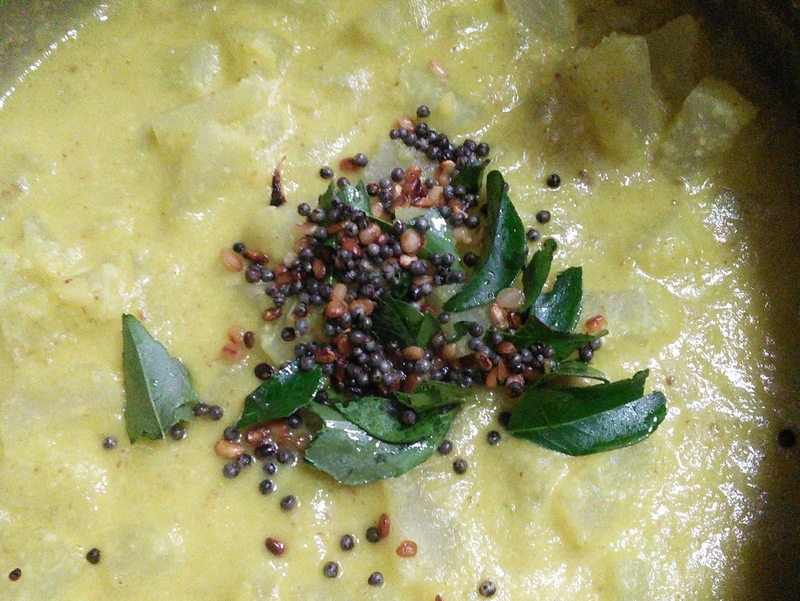 Heat oil in a pan and add the mustard and urid dal. When it splutters add the curry leaves and pour it to the kootu. Close the kootu with a lid. 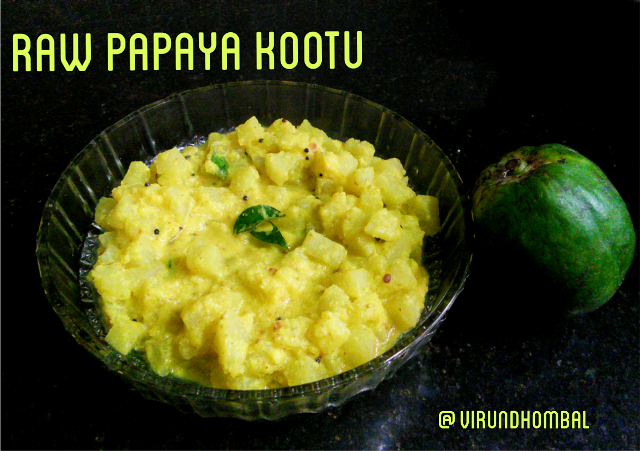 Serve this kootu for sambar, pulikuzhambu, rasam and also for chapathi.